The Mission of the Eta Alpha Alumni Association is to foster the relationships of the Pi Kappa Alpha alumni in order to provide the opportunity to keep in touch and support the Eta Alpha active Chapter. The Vision of the Eta Alpha Alumni Association is to become a premiere Pi Kappa Alpha Alumni Group and a strong supporter of the Eta Alpha Chapter. Network with other alumni and get information and updates on all that is going on with the chapter as well as with the Alumni Association. Join the group. 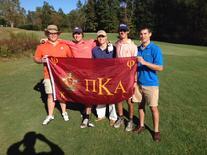 The Eta Alpha chapter holds an Annual Alumni Golf Tournament every fall at a local golf course. The 2014 Tournament had to be cancelled due some unfortunate circumstances within the Greek Community last fall. Check back later for more information on the 2015 Alumni Tournament when it becomes avaliable.